Figs A4.4, 14; B5.1, 29, 32, 35, 36, 38, 60; C22.1–4. Taxonomy. 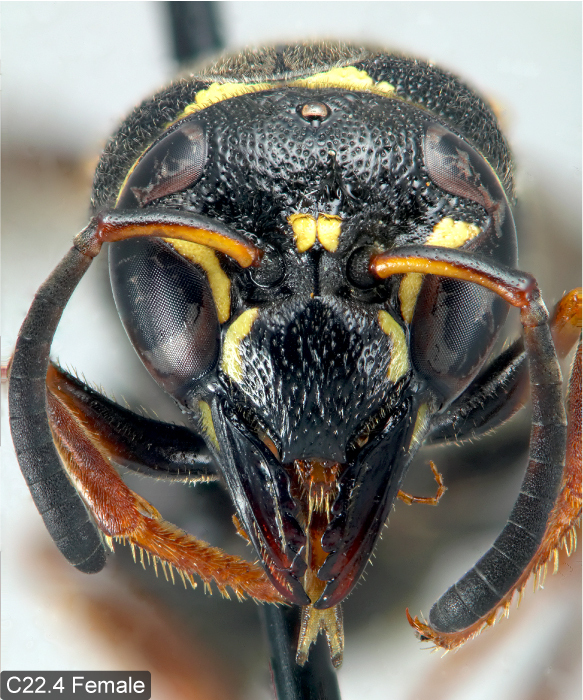 Northeastern populations of E. auranus have been referred to under the name E. auranus aquilus Bohart, 1974 in the literature. Bohart and Menke (1974) stated that “E. auranus aquilus occurs over most of the eastern United States”. 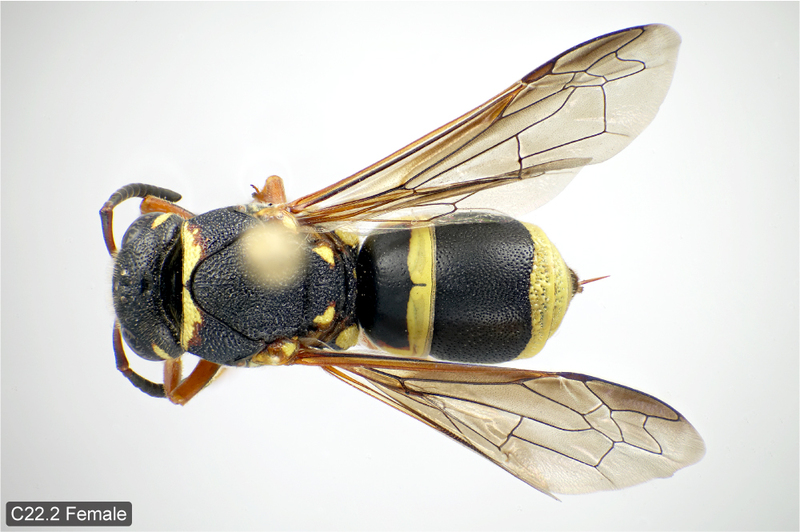 However, most of the eastern populations, except those from Michigan and Minnesota, actually belong to a closely related, undescribed species (see comments under Euodynerus sp. G). 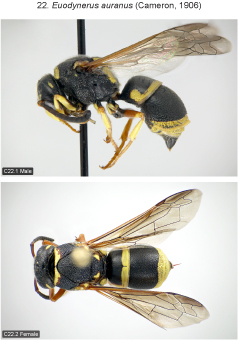 Specimens from the type locality of E. auranus aquilus in southwestern Texas show a different colour pattern than northeastern populations (ON, MI, MN), and the subspecies name should therefore not be applied to the latter. 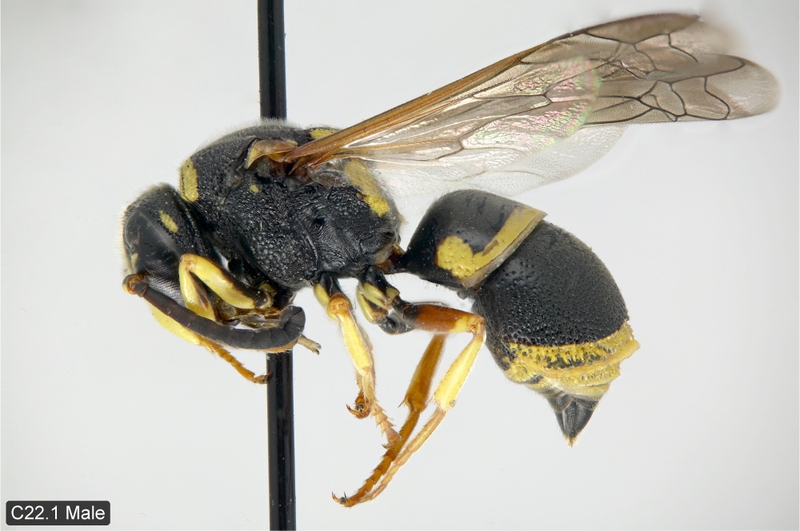 Western E. auranus have been classified into four different subspecies: E. a. auranus, E. a. albivestis (Bohart, 1939), E. a. azotopus (Bohart, 1939), and E. a. aquilus (see Krombein 1979). Currently, there is no available subspecies name for the colourationally distinct northeastern populations. Species recognition. Euodynerus auranus and sp. G are the only eastern Nearctic species of the genus with well-developed rake setae on the female fore basitarsus. Males of both species are easily recognised by the extensively yellow lower surface of flagellomeres I(–VI)–VII and black flagellomere XI (in most other species the lower surface of flagellomeres I–VII is black, except in E. castigatus, which has a partially yellowish flagellomere XI), and a relatively longer male clypeus (least interocular distance / clypeal length 0.88–0.93; in E. castigatus 0.98–1.09). Euodynerus auranus and sp. G can be separated by the characters provided in the key. Variation. Fore wing length 7–9 mm (♂♂), 7–10.5 mm (♀♀). Punctation of tergum 1 extremely variable, very sparse and inconspicuous to almost as strong and dense as on tergum 2. Apical reflex and punctation of apical fascia of tergum 2 also very variable, on average stronger in male than in female; punctation within apical fascia coarse or very coarse, the punctures deep and separate or confluent with strongly projecting aciculate interspaces. Female clypeus usually with a pair of basal yellow spots, sometimes absent. Interantennal spot in female usually more or less divided medially, rarely missing, in male almost always extending all the way to clypeus. 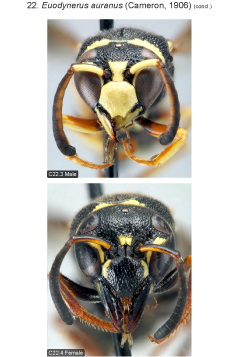 Yellow stripe along inner eye margin exceptionally absent in female. Mandible black to reddish in female, always with yellow basal spot. Ferruginous markings usually not developed on head, occasionally present in postocular spot of female (exceptionally in male), very rarely in female clypeal spots. Yellow pronotal band sometimes linear laterally, a ferruginous posterior border very rarely present in male, present or absent in female but usually very narrow and incomplete, exceptionally broad and extending to middle of pronotum posteriorly. Spot on upper mesopleuron small or absent (usually absent in male), almost always yellow, very rarely ferruginous. Scutellum with a pair of yellow spots (rarely absent in male), sometimes bordered with ferruginous, very rarely entirely ferruginous. Metanotum with or without a pair of small yellow spots (less commonly in male), posteriorly sometimes with a narrow, transverse, ferruginous band. Yellow propodeal spots large, very rarely small or bordered with ferruginous. Metasomal terga 1(–3)–4(5) with yellow apical fasciae in female, in male terga 1(–4)–5(6) fasciate. Tergum 1 with or without narrow ferruginous area bordering lateral forward extension of yellow apical fascia, tergum 2 exceptionally with a pair of small yellow discal spots. Sterna usually without complete apical fasciae in female, in male fasciae usually complete on sternum 2 and often 3. Distribution. Canada: ON to BC, newly recorded for ON, MB, SK, and BC. 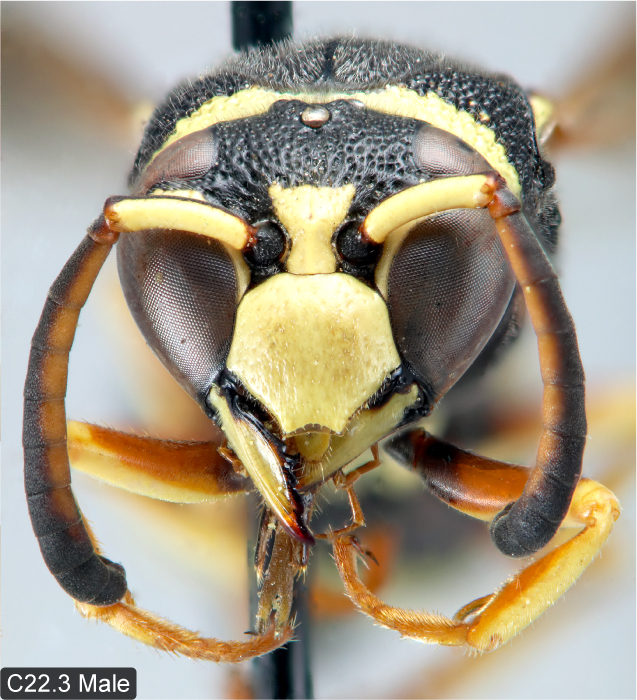 Northeastern U.S.: MI (Bohart 1939a; misidentified as E. boscii boscii), MN (new state record: 1 ♀, Pelican Lake, Nisswa, UCDC); western U.S. east to ND, KS, western TX. Mexico: Coahuila, Chihuahua, Baja California, Durango (Krombein 1979, Rodríguez-Palafox 1996). In Ontario the species is almost entirely restricted to dune systems along Lake Huron. This peculiar distribution pattern is similar to that of other western aculeate species that reach the eastern limit of their range on dune systems in Ontario (e.g., Mellinus abdominalis Cresson, Diploplectron peglowi Krombein, both Crabronidae; Buck 2004). The newly discovered Ontario populations mark the eastern limit of the species distribution. Biology. Evans (1978) found this species nesting in an apparently abandoned, incipient burrow of Bembix pruinosa Fox (Crabronidae) in a large blow-out dune area in Weld Co. Colorado. The nest had a single mud cell 15 cm from the entrance of the burrow and 5.5 cm below the soil surface. The cell had very thin walls (thickness 0.3 mm), and was filled with 25 caterpillars of two different genera of Gelechiidae. In Ontario the species is also restricted to dune habitats, mostly along Lake Huron (except for two old records from Strathroy, Middlesex Co. and “E Ont.”). Apparently the species is also capable of digging its own burrows. In July 2003 the senior author observed one female starting to dig into slightly sloped, friable sand contiguous to an Arctostaphylos twig on a dune at Carter Bay, Manitoulin Island (Ontario). The observation was interrupted after the female had dug about 1 cm into the sand. Females are well equipped for digging burrows by the presence of rake setae on the fore basitarsus, a hitherto unreported morphological adaptation in Eumeninae (see General Part – Morphology). Euodynerus auranus and sp. G are the only Eumeninae species in Ontario with rake setae, even though several other species in the genus (e.g., E. crypticus, E. annulatus) also nest in the ground. On various occasions females were observed investigating spun-together leaves of Arctostaphylos and an unidentified dune Asteraceae for the presence of prey (Buck, pers. obs.). Conservation. Because of its local occurrence along Lake Huron and its specific preference for lakeshore dunes this species is one of the most vulnerable vespids in Ontario. Its survival depends on the preservation of intact dune habitats, which are threatened by excessive use or destruction through development, off-road vehicles, vacationers, etc.